Papua New Guinea Foreign Minister Rimbink Pato says the funding boost by Australia and New Zealand will assist Pacific nations advance their capacities to develop economically. At the same time it will also enhance governance and security in island states,” he said. Mr Pato was responding to Australia’s A$1.3 billion (K3.28bn) aid package for the region handed down by Finance Minister Scott Morrison on Tuesday night. He also cited New Zealand’s NZ$714 million (K1.69bn) aid for the region announced by his Kiwi counterpart Winston Peters. 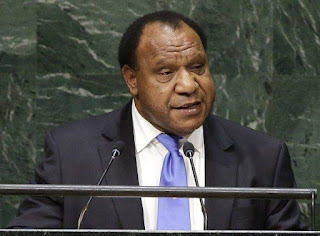 “The big increase in their budgets by both of these close friends of PNG looks set to give Pacific Island states the opportunity to boost our capacity to develop economically and in governance and security,” Mr Pato said. “Australia is already our biggest development partner in the Pacific, and to PNG in particular, but this generous increase to $1.3 billion makes it the biggest assistance package ever and so is destined to have a significant impact. “We are grateful for the support of the esteemed Prime Minister Malcolm Turnbull, his respected Foreign Minister Julie Bishop, and all those other ministers I recently met with in Brisbane and London. “The extremely generous assistance for us to host APEC, nearly $20 million and to install an underwater communications cable are examples of the support, but let me also mention the funding for future leaders and many other projects too numerous to list. Mr Pato said it had become clear during recent meetings between Prime Minister Peter O’Neill and his Australian and New Zealand counterparts, as well as between foreign and trade ministers, that the relationship with Papua New Guinea was highly valued. Mr Pato said Papua New Guinea also welcomes the development assistance provided by friends such as Japan, the United States of America, South Korea and China.